Possibly the only photo taken indoors at Friars Walk. Mother & Peadar (?) The Head and the Heart of our family, my Mother and Father, were truly remarkable people, who were born before their time. They were enlightened and progressive, but their greatest influence on their childrens lives was the love in which they enveloped them and the good example of their own lives which they gave them. By the late May Crowley. The Heart of the Family. My mothers’ maiden name was Mary Mehegan. She was born at 41 Lough Hill, Cork, on 21th August 1881. Her Mother, Mary Anne Courtney, was born in Skibbereen, Co: Cork. 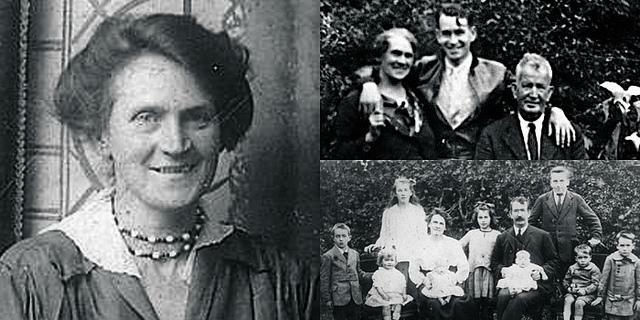 There are still Courtney’s living in Skibbereen, descendants of her brother. Her father, Charles Mehegan, was of Scottish descent. He was a moulder by trade. My Mother was the eldest of her Family and had three sisters and six brothers. My mother was attractive, well-proportioned and about 5ft. 6ins. In height. She was bright, cheerful and musical and had a very sweet singing voice. The Student Prince, Rose Marie, Ramona, the Operas – she loved them all. She loved reading and the characters from the stories she read lived for her and for us when she described them to us. Quilp from “the Old Curiosity Shop”, Topsy, Eva, Simon Legree and Uncle Tom himself, from Uncle Toms cabin, were very real to us. She was quick to recognize similar traits and qualities in people she met or heard about and to identify them with the admirable or detestable characters of her reading. My mother was very hospitable and loved company. She was a marvelous cook. Nothing I’ve ever eaten since could compare with her dishes of Baked Sprats, Stuffed Veal, Apple Dumplings, etc. She made Jam of all kinds as we had an orchard. Yeast bread was another of her specialties. She was always busy as one would expect with a husband and a family of ten children, but she coped with it happily and, for good measure loved having visitors. Outings consisted mainly of frequent drives in the trap and occasional trips by train to the seaside. On one occasion, my Mother spent a week in Limerick. This visit inspired the name “The rhubarb Leaf” for our family record. While she was in Limerick, Peadar wrote to her giving her an account of what was happening at home under the title of ” The Rhubarb Leaf”. To explain the reference, my father had, at that particular time, a great interest in the production and sale of Rhubarb. How she enjoyed that letter! When she returned home, the welcome she got was tumultuous. The younger members threw themselves at her. She had never been away from them so long before. Even when she did her routine shopping, she would hardly be gone half an hour when the younger ones – and the not so young – would be on the road waiting for her to come home. Her parcels would be carried for her by her retinue who had run the lenght of the road to meet her when they saw her coming. Mother loved beauty in thought, word and deed. She was broad minded, sympathetic, kind and loving. She ruled her family through love. No-one feared her but no one hurt or disobeyed her. She never grew old. She was always young at heart and she died at the early age of fifty nine. She died on 6th August 1941. The Heart was gone from our Home just nineteen months after the head had gone. Life was never the same afterwards for the family.They live on in their children and will continue to live on in their thirty two grandchildren and their twenty three great grandchildren and in the many more who will follow on. Thus yesterday, today, tomorrow come. They hustle one another and they pass. But all our hustling morrows only make the smooth today of God.